Safeway & Betty Crocker Giveaway! My friends over at MyBlogSpark have another giveaway for us! Safeway is doing this crazy deal right now where all their Betty Crocker cake mixes and brownie mixes are on sale for 69 cents each if you buy four through April 6. Now for the giveaway! 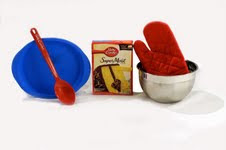 I've got a "Spring Sweet Treats" prize pack that includes a silicon baking pan, stainless steel mixing bowl, oven mitt, Betty Crocker mixing spoon, and a $25 Safeway gift card. Comment on this post with your favorite variety of cake and I'll pick a random winner on March 31st. Safeway and Betty Crocker provided my gift card and the prize pack through MyBlogSpark. It's surprisingly cold out these days, so soup was on the menu today. I cracked into a can of Progresso from the cupboard - Chicken & Wild Rice today. In January, Progresso provided me with some free cans of soup but I don't remember if this was one of them. The wild rice was too crunchy for my taste. I don't usually eat much wild rice, so maybe it's not the rice but it's me. I just prefer the long-grained rice that's in the other soups. I was also surprised by the slightly odd tomato chunks in the soup - they were kinda stringy (like sun-dried tomatoes that were re-constituted).